It is impossible to adequately describe in words the greatness of the Zella Copper and Silver routine. Nowhere will you find a routine so easy and pleasurable to present, yet so profound in its effect upon those watching it. The routine has been thoroughly tested from every practical and theoretical standpoint and has been performed with unparalleled results before men experienced in coin magic. 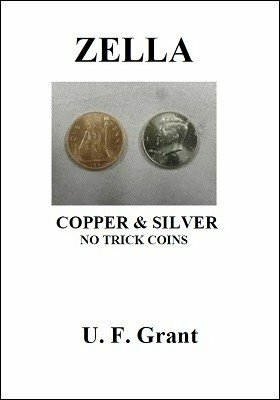 No double-sided or other trick coins used. No gimmicks. Only regular coins used. Easy to learn as there are no difficult sleights. First Effect: Three coins are on a table; two half dollars and an English penny. The English penny is placed in the left hand. A half dollar is placed in the left hand. The remaining half dollar is waved over the closed left hand, which, when opened, reveals that the half dollar has shrunk to half its size, since you now have an English penny and a quarter. All coins are replaced on the table. Second Effect: The quarter is tossed into the left hand, and then the English penny is tossed into the left hand. The right hand waves the half dollar over the closed left hand. The left hand is opened and in place of the English penny and quarter, it now has a half and a quarter. Again all coins are replaced on the table. Third Effect: The half dollar is tossed into the left hand, and then the quarter is tossed into the left hand. The right hand waves the remaining half dollar over the left hand. When the left hand is opened it contains a half dollar and an English penny and you are back where you started. Fourth Effect: The coins then penetrate through a handkerchief several different ways. Complete illustrated directions making it easy to learn. Everything can be examined. 1st digital edition 2017, 6 pages.